on behalf of the French Reference Center for Thrombotic Microangiopathies› Author Affiliations Funding This work was partly funded by a grant from the Délégation Régionale à la Recherche Clinique, Assistance Publique-Hôpitaux de Paris (PHRC AOM05012) and declared at ClinicalTrials.gov record (http://clinicaltrials.gov/show/NCT00426686, study ID number: P051064, Health Authority: France, Ministry of Health), a grant from CSL-Behring (AP-HP-2017–47–26) and a grant from Fondation d'entreprise Groupe Pasteur Mutualité. This study was also supported by the National Plan for Rare Diseases of the French Ministry of Health and the European Framework Program for Research and Innovation (HORIZON 2020 Marie Sklodowska-Curie Innovative training network PROFILE grant 675746). 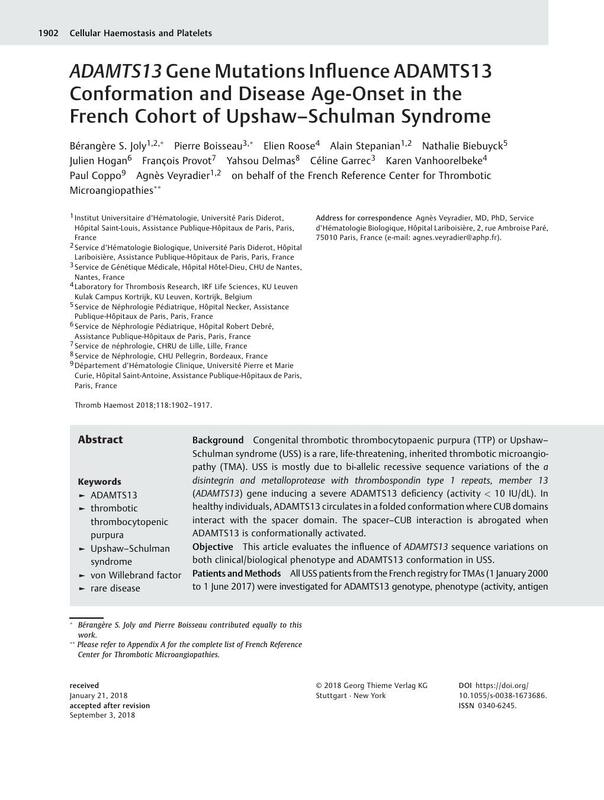 Background Congenital thrombotic thrombocytopaenic purpura (TTP) or Upshaw–Schulman syndrome (USS) is a rare, life-threatening, inherited thrombotic microangiopathy (TMA). USS is mostly due to bi-allelic recessive sequence variations of the a disintegrin and metalloprotease with thrombospondin type 1 repeats, member 13 (ADAMTS13) gene inducing a severe ADAMTS13 deficiency (activity < 10 IU/dL). In healthy individuals, ADAMTS13 circulates in a folded conformation where CUB domains interact with the spacer domain. The spacer–CUB interaction is abrogated when ADAMTS13 is conformationally activated. Objective This article evaluates the influence of ADAMTS13 sequence variations on both clinical/biological phenotype and ADAMTS13 conformation in USS. Patients and Methods All USS patients from the French registry for TMAs (1 January 2000 to 1 June 2017) were investigated for ADAMTS13 genotype, phenotype (activity, antigen and autoantibodies) and conformation. Clinical records were analysed (inaugural acute TTP and follow-up). Child-onset USS was compared with adult-onset USS. Results Fifty-six USS patients from 51 families (34 child-onset and 22 adult-onset cases) were enrolled. Child-onset USS was characterized by a large panel of ADAMTS13 sequence variations (n = 43), spread all over ADAMTS13 gene and not correlated with either clinical features or plasmatic ADAMTS13 parameters. In contrast, adult-onset USS, consisting exclusively in pregnancy-induced TTP, included a smaller and distinct panel of ADAMTS13 sequence variations (n = 20) because of one mutation (p.Arg1060Trp) present in 82% of patients. ADAMTS13 conformation was studied in 16 USS patients (5 child-onset and 11 adult-onset USS, encompassing 16 distinct ADAMTS13 sequence variations) whose ADAMTS13 antigen levels were detectable: 14 of 16 patients (87.5%) exhibited abnormalities of ADAMTS13 conformation. Conclusion In USS, age-onset defines two entities and ADAMTS13 sequence variations modify ADAMTS13 conformation. * Bérangère S. Joly and Pierre Boisseau contributed equally to this work. ** Please refer to Appendix A for the complete list of French Reference Center for Thrombotic Microangiopathies. B.S.J. collected, analysed, interpreted data and wrote the manuscript; A.V. and P.C. designed and supervised the study and co-wrote the manuscript; B.S.J. and E.R. performed and interpreted ADAMTS13 phenotypic experiments; P.B. and C.G. performed genetic analysis and critically reviewed the manuscript; K.V. designed and supervised research, interpreted data and reviewed the manuscript for scientific content; N.B., J.H., F.P. and Y.D. included patients; A.S., N.B., J.H., F.P. and Y.D. co-analysed data and critically reviewed the manuscript. The final version of the manuscript was read and approved by all authors.